I'm on a roll lately with my creations. I'm having a blast making things for my grandchildren. 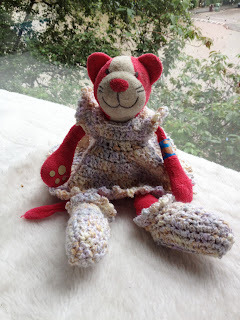 My granddaughter Fenna asked me if i could crochet a dress and shoes for her favorite sleeptoy. When i was babysitting, i cooked up this outfit. She was over the moon! She doesn't know it yet, but i knitted her a scarf and hat for the coming winter season. The material is Phildar Phil Douce, a very fluffy and soft yarn. The hat is crocheted, the scarf is knitted and they are both embellished with hyperbolic flowers. It will be a gift the next time she visits me.